"Hi Troy, You can certainly add me to your list of references. You have been very helpful and have come through every time making a big difference in the presentation of my cars brought to auction. The quality and delivery service are awesome. It's always a pleasure working with someone who shares the same enthusiasm for their work as I do for my cars. It makes for an excellent team and successful results when it counts. Thanks Again"
"Hi Troy, The boards arrived right before I left and I was able to look them over the night before I flew out. They are beautiful and I am quite pleased. Thank you for a fine job!" "Hi Troy, Thought I would send you a ouple of pictures of Black Betty and her show board at a couple of shows. Since she got her show board she's taken hopme a Top 20, Best in Class, and a Best in Show! Coincidence? I think not! Love my Show Board!" "I got the show board and it looks great! Very professional job! ... it's top shelf stuff. I would recommend it to anyone! Thanks!" 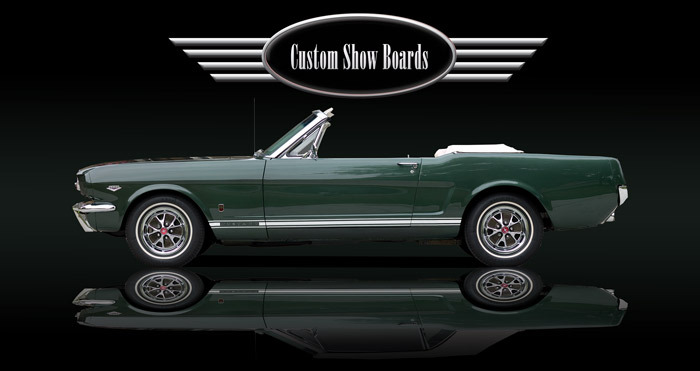 "Troy, I received the Custom Show Board for our 66 GT350H and it is a beautiful piece of work. Wife usually doesn't get all that excited about my car stuff, but she has commented several times on the board and loves that her swans are in the background. We have only been to a couple of cruise nights but are looking forward to our next big show where we can really show it off. Seriously looking to do a couple more. Thanks again"
"Troy, We were just amazed at the quality and composition of the images that you sent. It was really hard to pick out just a few for the covers. We are very pleased to feature your photography on the covers of our Virginia Classic Mustang Parts Catalog." "I just received my Custom Show Board from Troy at Custom Show Boards. I just gave Troy the pictures and information and let him use his creativity to put together a design that he liked. I could not have been more pleased with the results. The quality of the actual printed board is really nice, and his design work is great! Along with the Custom Show Board, he created some post cards and business cards that you may see in your "goodie bag" at an upcoming Mustang show." -Brant Halterman, Virginia Classic Mustang, Inc.
"Troy, I have both Custom Show Boards framed and hung on my office wall. They get a lot of attention and are a great conversation starter. Everyone is amazed at how the boards display all the attention to detail on the cars. Just the right light plus the angle of the shot is definitely a talent that comes from having a show car yourself and seeing detail the camera will accentuate. Your great customer service and high standards should keep you very busy." "Troy, it has been a pleasure doing business with you as the quality of your work is far better than I expected. Thank you for your on time delivery and now that we have met in the car club etc. I hope we will become even better friends." "For anyone interested, Troy does a great job on these! You won't be disappointed!" "While I was at "Back to the Fifties" in June of this year located at the St. Paul fairgrounds, Troy took a number of pictures of my '59 and professionally arranged them along with specific information about the vehicle into a showboard measuring 20" x 20". The quality and arrangement is professionally second to none... Reasonably priced and customer satisfaction is of utmost importance." "I worked with Troy to create my showboards and I am very happy with the results! I have a '70 Boss 302 and a 69 Mach 1 CJ. He is very conscientious, accommodating, and came up with some great ideas to make our boards unique and personalized." "I have been working with Troy on a show board for my GT350 and he has been excellent in helping me put my ideas together. Fast turnaround on changes, very helpful throughout the entire process. I would highly recommend him to anyone thinking about creating one of these pieces." UPDATE: "Hi Troy, Yes I got the show board, I thought it was just spectacular!!!!!!!!!!! I was going to try to get you a CD of other shots to you to make up a second board. I am very happy with the results and will be showing it to the Washington State Shelby Club Members at this month's meeting." "Troy, Wow!! Knock me out!! I like it. I think the show board looks outstanding. Lots of fun stuff on it, and I like the flames in the background and the little touches like the Demon carb, the skull, etc. Excellent work!!" "Hi Troy, I just received the box of Custom Show Cards! They look great. Now it's time to send them out to a lot of people! We really, really like the way the Pacer board turned out-the curved line that matches the tail really sets it off." UPDATE: "We sold our Eagle about a month ago and it is now living in Canada. We're so glad we got the show board made so we can remember the plane. Even though the new owner has to change the registration numbers, we're going to send him a bunch of the show cards - he can hand them out to people when he goes to airshows and the like. We've gotten such great comments on our Pacer's show board." "Troy, The board is great!! It totally exceeded our expectations! Thank you!" "GOT THE BOARD ON WEDNESDAY IT LOOKS GREAT. I AM VERY PLEASED WITH IT. I HAVE YOUR BUSINESS CARDS AND WILL GIVE THEM OUT WHEN I GO TO SHOWS AND PEOPLE ASK ABOUT THE SIGN. YOU WERE A PLEASURE TO THE BUSINESS WITH & VERY PROFESSIONAL ." "Troy, The showboard is absolutely fantastic. You did a great job! We are very pleased...."
" Troy, I have nothing but praise for the board. It was on my desk this morning when I got in. It is 1000 times better in person than even the images. Looking forward to debuting this at the All Ford Nationals in Carlisle PA on June 6th. It's perfect!" "Hi Troy, Thank you for everything! I am very happy with the showboard and I appreciate your time and effort! It was a pleasure to work with you! Thanks Again!" " Hello Troy, I just opened up the package and took out the show board. """Awesome Job Troy"""
It looks fantastic and I can not wait to use it. Your attention to the details was amazing and the finish product showed just that. Thanks for everything and the smooth transaction... Kindest regards my friend!"